Any visitor to Ankara quickly learns that there is no shortage of places to eat. At times it feels as if every street in this city offers a impressive variety of restaurants poised to please almost every taste. During the year that I’ve been living in Ankara, much of my free time has been spent exploring many of these offerings. I’ve learned that successfully navigating the myriad options is no easy task. These experiences gave birth to the blog you are reading. Over the upcoming year, I plan to chronicle my culinary adventures in Ankara, creating an English-language resource for those who hope to eat the very best during their stay in Turkey’s capital city. While I don’t consider myself to be a trained critic or a culinary authority in any way, I love to eat out and do so frequently with an unadulterated passion. Thank you for reading, and please feel free to email me with the name of your favorite Ankara eatery for review. I am in my second year of teaching English at the Bilkent University School of English Language (BUSEL). While at university, I studied international relations. This created an interest in Turkey that brought me here after graduation. To learn more about my background and (non-food) related interests, visit my Google Profile, look at my photos on Flickr, or follow me on Twitter. Me, with kokoreç in hand. My son loves his food. So anyone reading this blog cannot go wrong. I just came across your blog and i like it. It’s nice and rare to see a non-Turkish person’s point of view about food in Ankara. Also Ankara seriously lacks blogs on food. I hope you continue for a long time. 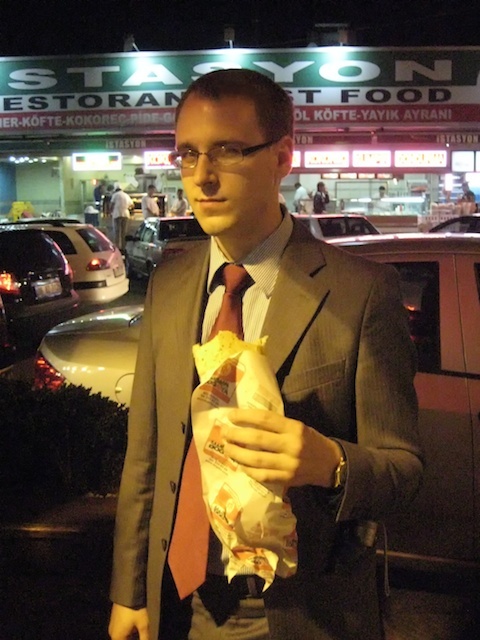 I also have a blog about food in Ankara, it’s in Turkish, but at least you may get an idea. It’s good to see you launched a well-organized and lovely blog about eating alternatives in Ankara! I also wrote a blog mainly about Ankara. There’re a number of posts on the blog about Ankara restaurants! Love it! Thanks for blogging. We may be spending the summer in Ankara, and this will be really helpful. Posting a link to this site from mine. Carla, I haven’t found any good künefe in Ankara. Once you’ve had it in Hatay, everything else is such a downgrade. If you find any, let me know! Thanks for the info, sad as it is. Don’t think I’ll be making it to Hatay. I guess the best I’ve had is in Istanbul at Sütiş. I love it with the clotted cream. And who can argue with a bowl of ground pitachios placed on the table? Best condiment idea ever. Carla, Edessa in Emek, Ankara does a fair approximation to what is available at Antakya. You may as well try it. What a wonderful blog, congradulations. I am so impressed by your reviews on some of the eateries, because I have similar experiences. I see that you visited a variety of cuisines, may I humbly suggest to you Konyali Tandir near Acity mall in Ostim. They serve the most succulent and delicious (lamb) meat ever. Also the Chinese place at Altinpark is very good, it is sponsored by the People’s Republic of China. As a Bilkent graduate and a new blogger I am pleased to find out about your blog. Actually, we are doing very similar things. Why don’t you check out?